Hover over hotspots below for more details. This 1924 Palisades Building will be rehabilitated and updated with hotel guestrooms and suites in a variety of sizes and configurations. Design inspiration for the historic Renaissance Revival building will be taken from images of the building from the 1940s-1950s. 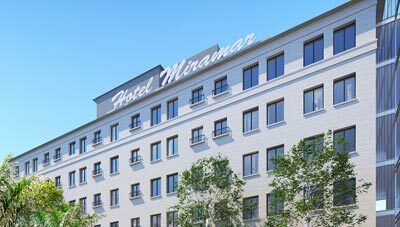 In addition to renovated guest rooms and suites, a new rooftop sign inspired by the historic Miramar Hotel is proposed to further tie the building’s history into the rest of the project. 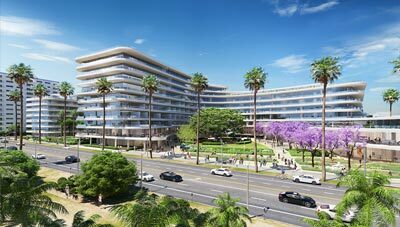 The existing 10-story Ocean Tower and 12-story elevator tower will be replaced with a new 10-story contemporary building called the Ocean Building, with sweeping curves that celebrate the curvature of the Moreton Bay Fig Tree. The height of the Ocean Building will follow the DCP maximum height limit of 130’ and will step down as it heads east towards Second Street and again around the Fig Tree towards Wilshire Boulevard. 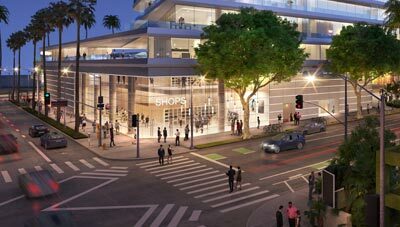 In order to prioritize the pedestrian experience on Wilshire Boulevard and minimize conflicts between pedestrians and vehicles, the main hotel entry will be relocated to Second Street. 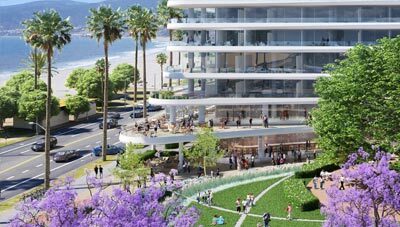 A grand opening (approximately 150’ wide and 30’ high) through the building is provided on Second Street to provide visual and pedestrian permeability through the site and offer new dramatic views of the Moreton Bay Fig Tree, Palisades Park and Pacific Ocean upon arrival. The new hotel entry court has been designed to accommodate significant on-site stacking capacity to meet demand during events. 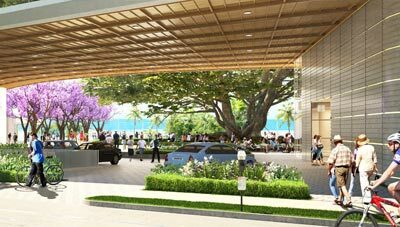 The Miramar Santa Monica will finally have enough on-site parking to meet the needs of all guests, visitors, residents and employees. Employees will no longer have to park in the neighborhood, opening up substantial amounts of parking on nearby streets for our neighbors. The ground floor will be dedicated for hotel public spaces, including retail and ballroom facilities. The Bungalow is located on the second floor with an expansive outdoor deck and the main hotel pool, pool café, meeting space and fitness & spa are on the third level. 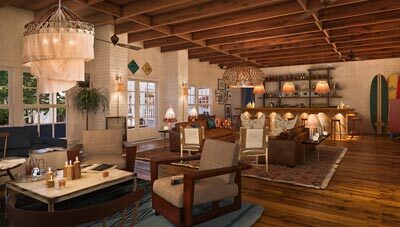 The new and improved Bungalow, with an expansive deck, will be located on the second floor along Wilshire Boulevard. This new and reimagined space will allow Santa Monica residents, guests and visitors stunning views of the Pacific Ocean and Santa Monica Pier. 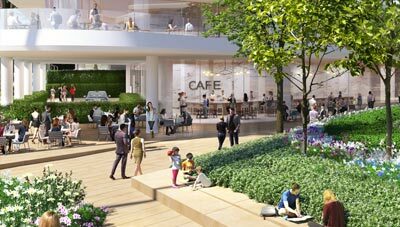 A publicly-accessible open-space garden (approximately 14,000 sf) will be anchored by a prominent piece of public art and activated by the adjacent food and beverage outlets. 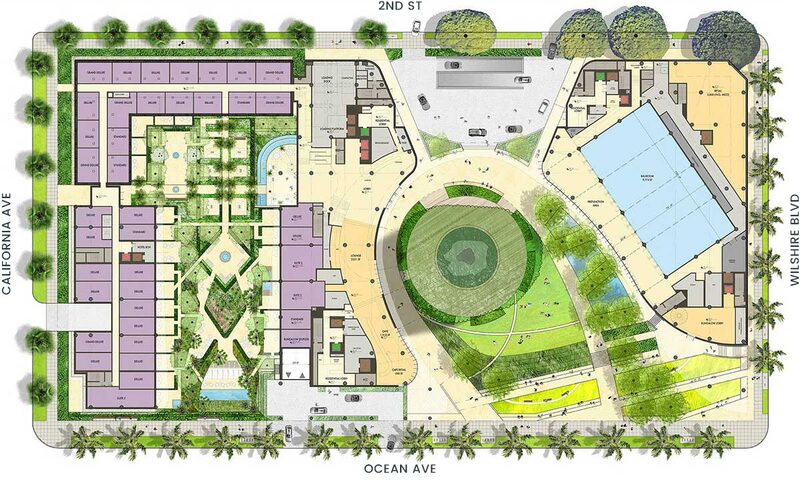 Ocean Avenue will be transformed into dynamic publicly-accessible gardens, providing a great amenity to the Santa Monica community and further enhancing the link to the adjacent Palisades Park. The landmark Moreton Bay Fig Tree will be protected, preserved and featured. A new wood deck will surround the tree to protect its roots and provide enjoyment and access to the tree along with service from the adjacent food and beverage outlets. 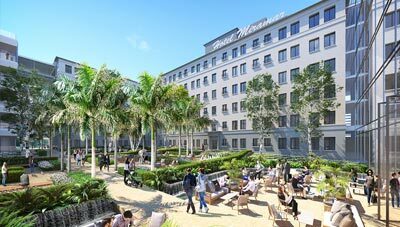 The Miramar Santa Monica will have 13,000 sf of meeting space, including an enlarged 10,000 sf divisible ballroom with 20-foot+ tall ceilings and state-of-the art audiovisual technology. The new ballroom, located on the ground floor and facing out toward the Moreton Bay Fig Tree, will create a magnificent event space to serve business, social groups and the community. The popular FIG restaurant will be reimagined in a new location on the second floor of the Ocean Building, with extensive outdoor seating above Ocean Avenue providing dramatic views of the Santa Monica Bay and the Pier. 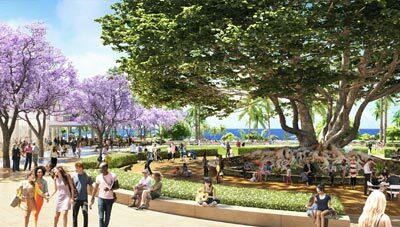 A new café will activate the Public Garden Terraces with outdoor dining and stunning views of the ocean and the adjacent Moreton Bay Fig Tree. This new café will be open daily and provide a space for Santa Monica residents and visitors to sit down, relax and dine al fresco while enjoying the new public gardens. A new, similarly sized seven-story addition to the existing Palisades Building will be built along California Avenue. The California Building will contain hotel guestrooms and suites in various sizes and configurations. The rooftop will include an outdoor deck for more intimate hotel functions. 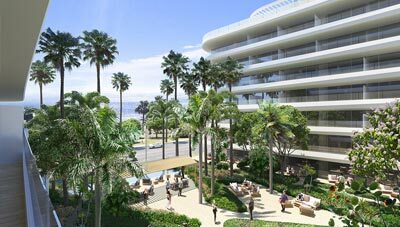 The Miramar Santa Monica will provide 477 subterranean parking spaces (428 striped and 49 aisle), an increase from the current 167 on-site parking spaces and enough to meet the needs of all guests, visitors, residents and employees. By providing adequate on-site parking and eliminating the need for valets to leave the site to park, the new plan will eliminate well over 100 duplicative valet trips around the site every day. By moving employee parking on-site, the plan will also free up a significant number of parking spaces on nearby neighborhood streets. The new Palisades Terrace, just off the hotel lobby, will prominently feature the historic Palisades Building. 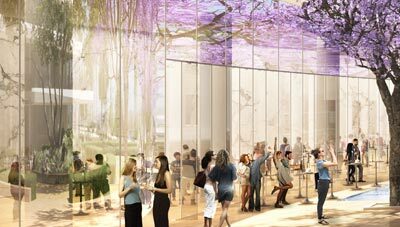 A two-story glass lobby will visually connect the Palisades Building with the other landmark on the site—the Moreton Bay Fig Tree. The Palisades Gardens, directly in front of the Palisades Building, respond to the rhythm and hierarchy of the building façade and create a central axis with the building’s historic entry, which is celebrated as the key organizing feature of the Gardens’ layout.